Lenovo's ThinkCentre Chromebox is a small-sized Chrome OS-powered desktop that occupies little desktop space. 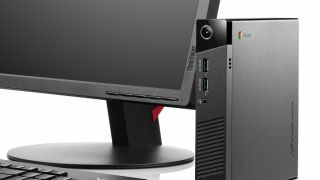 Joining Lenovo's ThinkCentre Tiny business, the new desktop Chromebox could be mounted to the rear of a display, converting the unit into a 23-inch all-in-one Chromebase with the ThinkCentre Tiny-in-One. Because of its compact, modular design, which offers space-saving features in a workspace or computer lab, the ThinkCentre Chromebox is targeted at education and small business users. Measuring 7 inches (17.78cm) tall by 1.4 inches (3.56cm) wide, the ThinkCentre Chromebox is only 2.2 pounds (1kg). "The one litre form factor adds further flexibility by allowing easy transportation from campus to campus or between office locations," Lenovo said in a statement. "Or a user can simply login to another ThinkCentre Chromebox or even a ThinkPad 11e Chromebook at another location and immediately access their cloud-based data and apps." The Chromebox will come with support for Intel's Broadwell Core processor, 16GB solid state storage, and 4G of RAM. The unit will debut this June starting at $199 (£130, AU$253). The ThinKCentre Tiny-in-One display retails for $279 (£185, AU$355), bringing the total cost, if you wish to have a modular AIO experience, to $478 (£315, AU$608). Unless you need the flexibility of Lenovo's modular design, the total cost is significantly higher than competing all-in-one Chromebase units, like the $349 (£207, AU$376) LG Chromebase. As just a Chromebox, the ThinkCentre Chromebox is competitive with other units on the market, including the $179 (£178, AU$230) Acer CXI. The value proposition Lenovo makes with the ThinkCentre Tiny business - rather than going with a regular AIO experience - is that users can save money when they upgrade. For example, if there is a new high resolution ThinkCentre Tiny-in-One display in the future, rather than upgrading the enter AIO, users can just upgrade the monitor and snap on the existing ThinKCentre Chromebox to the rear of the display. Similarly, if a user needs a more powerful ThinkCentre Chromebox with updated specifications, then the user can just buy a new ThinkCentre Chromebox and attach it to an existing ThinkCentre Tiny-in-One display. The upgrade cost on a non-modular solution, like LG's complete AIO Chromebase, would be higher since users would have to upgrade the computing components (the Chromebox portion) as well as the display every time.